In this Project it is proposed to design an embedded system which is used for tracking and positioning of any vehicle by using Global Positioning System (GPS) and Global system for mobile communication (GSM). 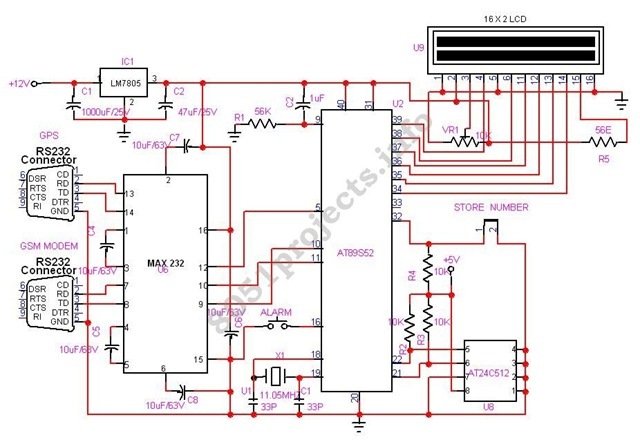 In this project AT89S52 microcontroller is used for interfacing to various hardware peripherals. The current design is an embedded application, which will continuously monitor a moving Vehicle and report the status of the Vehicle on demand. For doing so an AT89S52 microcontroller is interfaced serially to a GSM Modem and GPS Receiver. A GSM modem is used to send the position (Latitude and Longitude) of the vehicle from a remote place. The GPS modem will continuously give the data i.e. the latitude and longitude indicating the position of the vehicle. The GPS modem gives many parameters as the output, but only the NMEA data coming out is read and displayed on to the LCD. The same data is sent to the mobile at the other end from where the position of the vehicle is demanded. An EEPROM is used to store the mobile number. The hardware interfaces to microcontroller are LCD display, GSM modem and GPS Receiver. The design uses RS-232 protocol for serial communication between the modems and the microcontroller. A serial driver IC is used for converting TTL voltage levels to RS-232 voltage levels. When the request by user is sent to the number at the modem, the system automatically sends a return reply to that mobile indicating the position of the vehicle in terms of latitude and longitude. The project is vehicle positioning and navigation system we can locate the vehicle around the globe with 8052 micro controller, GPS receiver, GSM modem, MAX 232, EEPROM. Microcontroller used is AT89S52. The code is written in the internal memory of Microcontroller i.e. ROM. With help of instruction set it processes the instructions and it acts as interface between GSM and GPS with help of serial communication of 8052. GPS always transmits the data and GSM transmits and receive the data. GPS pin TX is connected to microcontroller via MAX232. GSM pins TX and RX are connected to microcontroller serial ports. Microcontroller communicates with the help of serial communication. First it takes the data from the GPS receiver and then sends the information to the owner in the form of SMS with help of GSM modem. GPS receiver works on 9600 baud rate is used to receive the data from space Segment (from Satellites), the GPS values of different Satellites are sent to microcontroller AT89S52, where these are processed and forwarded to GSM. At the time of processing GPS receives only $GPRMC values only. From these values microcontroller takes only latitude and longitude values excluding time, altitude, name of the satellite, authentication etc. E.g. LAT: 1728:2470 LOG: 7843.3089 GSM modem with a baud rate 57600.GSM is a Global system for mobile communication in this project it acts as a SMS Receiver and SMS sender. EEPROM is an Electrically Erasable read only memory which stores is used to store the mobile number. The power is supplied to components like GSM, GPS and Micro control circuitry using a 12V/3.2A battery .GSM requires 12v,GPS and microcontroller requires 5v .with the help of regulators we regulate the power between three components. Switch on the kit and wait until you see the Latitude and longitude on the display. The kit will send the location and UTC time to the number stored in its memory. For emergency the user can press the Button to send the Location to the number stored. stenara and karthickvikram like this.